Camilla Serck-Hanssen discusses her career as a scholar, her time as a project leader, and her plans for the future of the Centre for Advanced Study (CAS). 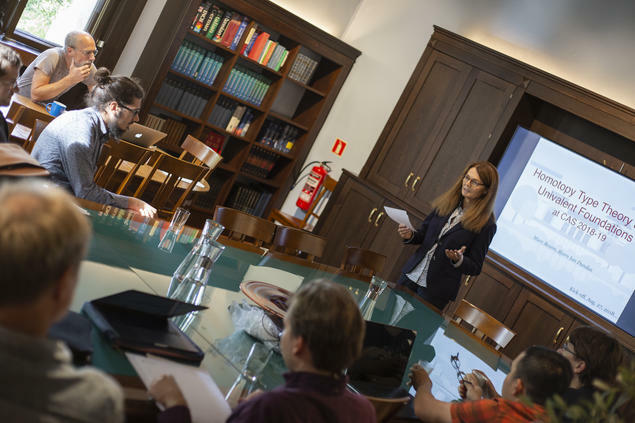 Serck-Hanssen, professor of philosophy at the University of Oslo (UiO), this month began her tenure as the sixth scientific director in the history of the Centre for Advanced Study (CAS). In the flurry of welcoming this year’s CAS fellows and adapting to the new position, Serck-Hanssen is looking ahead to make her mark on the Centre. On a day-to-day basis, Serck-Hanssen said she will work to recreate the atmosphere that she herself enjoyed as a CAS fellow for every scholar who arrives at the Centre. ‘Fundamental research, the way I see it -- and the way we approach it at CAS -- is giving these outstanding scholars a year of unlimited time and generous funding so that they can sit and concentrate on issues and topics that spring out of their own work,’ she said. Serck-Hanssen was one of two leaders of the CAS project Disclosing the Fabric of Reality - The Possibility of Metaphysics in the Age of Science, which was housed at the Centre during the 2015/16 academic year. That’s also when she had her eureka moment. Serck-Hanssen attributed the breakthrough to the uninterrupted time for research that her one-year stay at CAS provided her. Prior to solving the problem, she said it had vexed her for at least a decade. After leaving CAS and returning to UiO, Serck-Hanssen said that she found herself missing the days when she would barely make it through the front door of the Centre before immediately launching into an engaging, caffeine-fuelled academic conversation with one of the other fellows. The stay at CAS served as the launching pad to a new period in Serck-Hanssen’s career. First a proposal for a Centre of Excellence -- a long-term funding scheme offered by the Research Council of Norway (RCN) -- that she and a group of colleagues submitted reached the final evaluation round. Then in January 2016, she and two other colleagues at UiO were awarded a five-year FRIPRO Toppforsk grant by the RCN for their project Conceptual Engineering. Becoming scientific director doesn’t mean Serck-Hanssen will take a break from her own research, however. She has reserved one day a week for the duties of ensuring that the Conceptual Engineering project continues to operate smoothly, while the rest of her time will be spent at CAS (though she admitted that she is ‘probably going to be doing some research every now and then when I’m at CAS, too’). The career move reflects a shift in Serck-Hanssen’s own priorities as a scholar, she said. As a former CAS project leader, Serck-Hanssen recommended that this year’s project leaders pursue a ‘careful balance between open-endedness and structure’ as they navigate the academic year ahead. Perhaps most importantly, she said, project leaders should not be surprised if they end up diverging from their carefully made plans for the year, and that the outcomes and takeaways from their time at CAS could be different -- though no less beneficial -- than they had thought. ‘Research can be unpredictable,’ she said.